When you’re on a budget, getting an audio device that offers good performance for your PC or home stereo may seem impossible, but that couldn’t farther from the truth. Don’t believe us? Check Edifier’s R1280T active bookshelf speakers. The beautiful stereo pair is affordable, compact, and offers a bright, vibrant, balanced sound signature with an adjustable equalizer. It does check all the boxes, doesn’t it? If you’re interested in knowing more about these powered bookshelf speakers, here’s our detailed review. At this price point it’s hard to find any cons! For a pair of bookshelf speakers in the 100-buck price range, the Edifier R1280T boasts a pretty nice design that would allow it to fit nicely in any home or office décor. Each cabinet boasts a matte metallic finish on the top with wood veneer paneling on the sides. On the front panel, you’ll find a detachable grille that’s gray cloth with a four-inch woofer and 13mm silk dome tweeter and a back panel with a number of connectivity options. Edifier R1280T bookshelf speakers are active – no amplifier/receiver required. Each of the units measures 9.2 inches in height by 5.7 inches in width by 7.7 inches in depth. The Edifier R1280T weighs roughly 11 pounds, making it one of the lightest, most compact bookshelf models available today. The high frequencies are where the Edifier R1280T excel. These bookshelf speakers produce well-detailed highs with an adjustable quantity. The treble on the upper end has a somehow thinner character, but it’s still well-balanced and can retain texture and avoid wood stick phenomenon. Although the bass that these speakers isn’t the tightest, they still offer a well-balanced bass response with a slower decay. Of course, it’s not the punchiest of bass responses, but that’s expected considering the size of the cabinets, and it’s still smooth and room-filling as you’d expect from a bookshelf speaker. Mids are also a strength of Edifier’s R1280T bookshelf speaker as they can produce a smooth, well-balanced response within the midrange frequencies for well-reproduced vocals and acoustic music, making these speakers great for jazz, indie, and similar genres. The R1280T bookshelf speakers have the ability to reproduce vocals in an intimate and smooth manner, which means that you can enjoy all of your movies and TV shows without worrying about the lack of sound effects. The Edifier R1280T bookshelf speakers are packed well and come with everything you need to get them hooked up and good to go in no time. 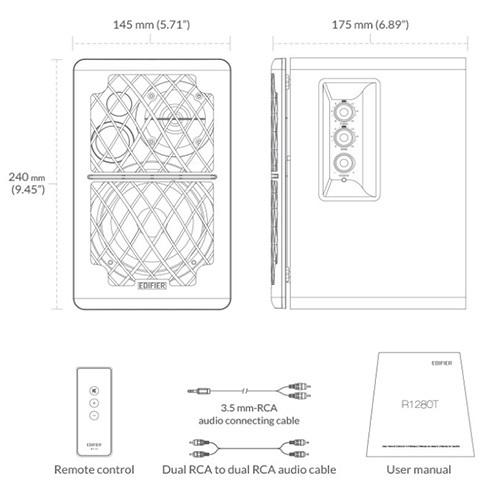 Inside the package, you’ll find the stereo pair, an RCA-RCA cable, an AUX-RCA cable, the speaker interconnect wires, an infrared remote controller, and a clearly-written user manual, although you won’t need the documentation to set everything up. The Edifier R1280T comes complete with everything you need. The Edifier R1280T bookshelf speaker isn’t the best of the best, but for the price you’re paying, it’s hard to argue with the quality, and it’s definitely easy to turn a blind eye to the few niggles that come with this device. If you’re looking for clear sounds (amplifier-inclusive!) 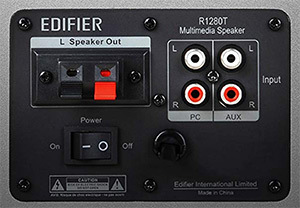 that cost less than many people spend on a night out at the pub, it’s really hard to find something that beats the Edifier R1280T in performance. At time of review, the Edifier R1280T featured in our Best Bookshelf Speakers Under $100″ category, and even sneaked into “Best Bookshelf Speakers Under $200“. Please check above for latest price and user reviews.